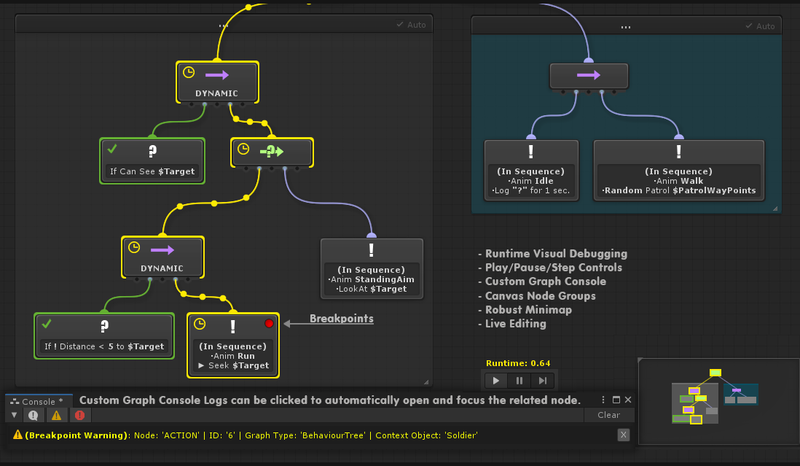 Behaviour Trees | Create Reactive Behaviour Trees in an intuitive visual node editor. Get NodeCanvas on the Unity Asset Store! NodeCanvas is the complete node-based Visual Behaviour Authoring framework for Unity, enabling you to create advanced AI behaviours and logic without the fuss in an intuitive visual node editor, including two powerful, separate, but interchangeable and fully featured modules for you to choose and easily add in your game. 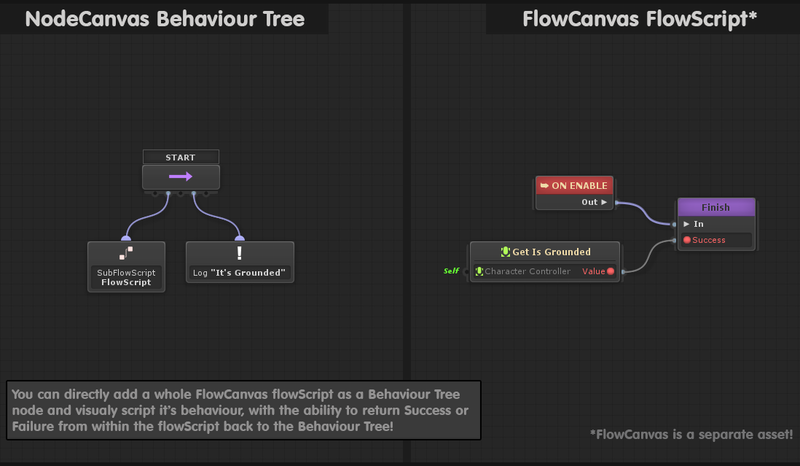 Use Reactive Behaviour Trees to create dynamic and believable character Artificial Inteligence or behaviours for your games, by putting together small and modular building blocks. Reuse made behaviours amongst any number of different agents, save valuable time and organize your designs better with seamless combination of Behaviour Trees with State Machines. Use Hierarchical State Machines to create definite state logic and systems. 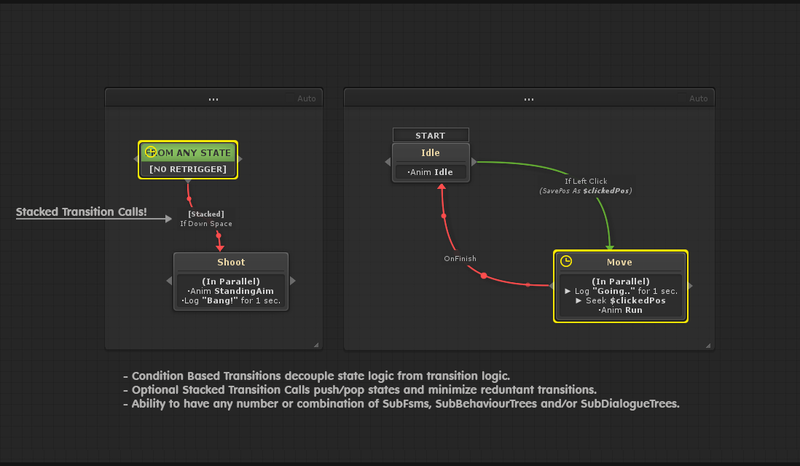 Switch from state to state based on modular conditional transitions directly. 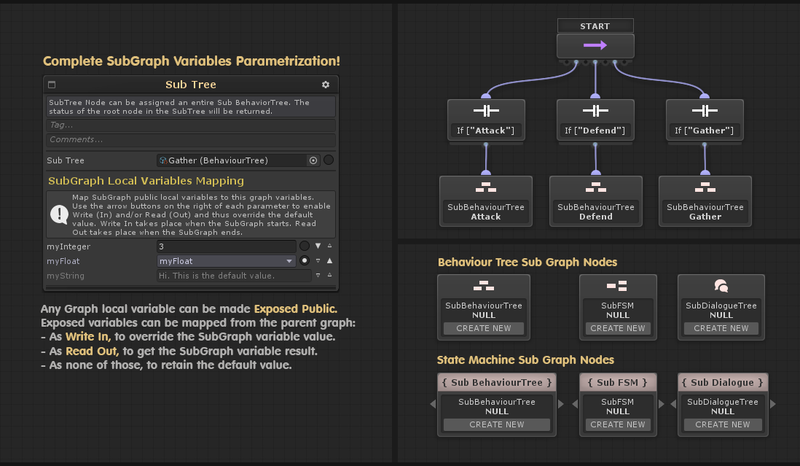 Use sub-state machines to create hierarchical and flexible state systems of any depth, or utilize sub-behaviour tree states to seamlesly combine the power of behaviour trees within state machines. NodeCanvas has the most intuitive and coprehensive visual node editor for Unity, polished with unique features and made by designers for designers! Zoom, Copy/Paste, Full Undo, Comments, Groups and more. 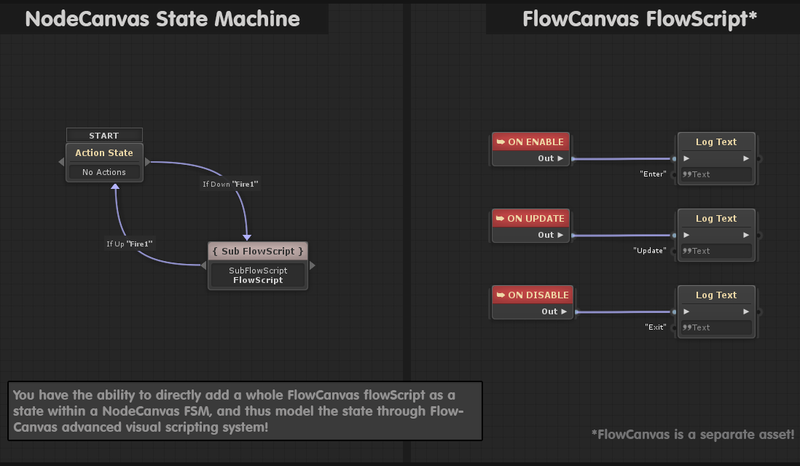 Seamlessly combine Behaviour Trees and State Machines, two of the most powerfull systems used in the industry into one coherent workflow. Use SubTrees and SubFSMs within one another for greater organization. 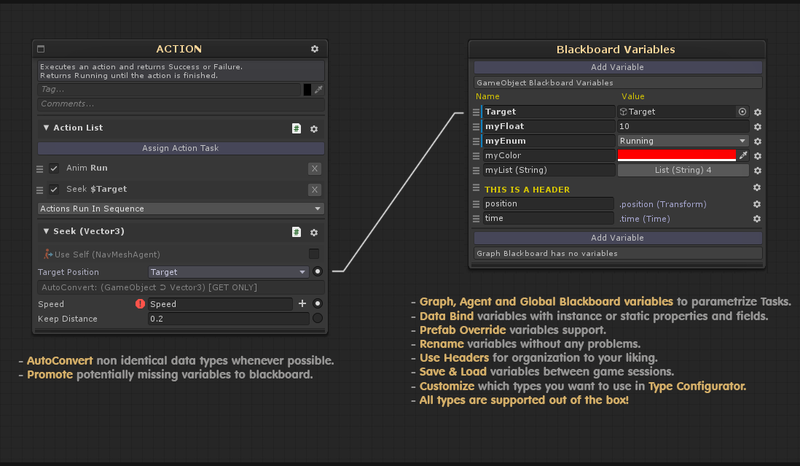 Communicate any type of variable, including lists/arrays, enums, interfaces and even your own custom types, by utilizing local or global Blackboards and parametrize behaviours to any extend. Utilize a non-destructive workflow using modular actions and conditions across both systems. Create once and use anywhere. Includes hundreds of premade game-oriented tasks to get you up and running quickly! See exactly how your designs react with advanced, colorful and informative visual debugging. 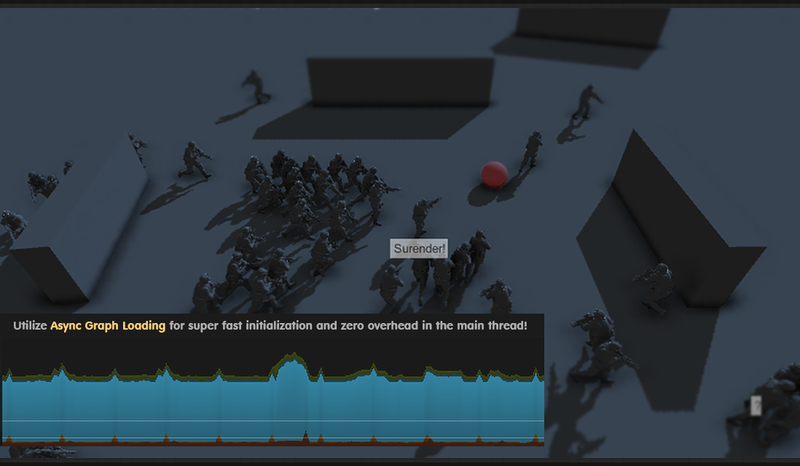 Live edit anything while in play mode, add breakpoints and get instant variable feedback. Data Bind (map) any variable to any component property on the agent game object, thus significantly decreasing the tasks needed and interfacing with existing code with ease. Sync blackboard variables selectively over the network to create multiplayer games using the new Unity’s UNET system with ease. Utilize the built-in event system and dynamicaly react to world changes with the added ability to transfer any variable data along with the events sent for fine grained communication. Extend upon the framework to create your own actions, conditions, nodes or even complete systems with the ease of a power and well documented API. 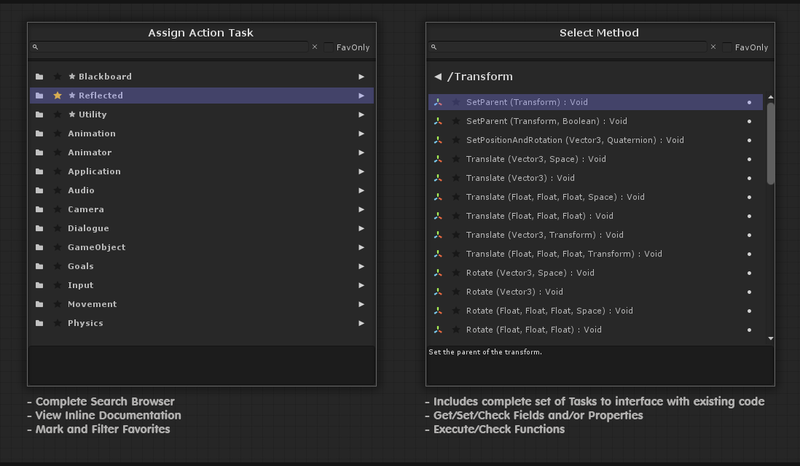 Utilize any existing code directly with advanced and extremely efficient reflection based tasks, automaticaly integrating any and all Unity’s and 3rd Party asset APIs without writing a single line of code! Control hundrends of behaviours simultaneously with rock solid performance and zero allocations after initialization. The full source code for both editor and runtime is open and included within the package! No DLLs here. You just can’t go wrong with this one! NodeCanvas is regularly updated with new features based on your requests, wth hotfixes and improvements, and it’s hardly going to stop any time soon! Publish to any non-beta platform supported by Unity out of the box, including iOS, Android and XBox. Enjoy extensive online documentation written with care and regularly improved based on your own feedback and suggestions. Enjoy responsible and fast support, always there to help you with any problem you may encounter.